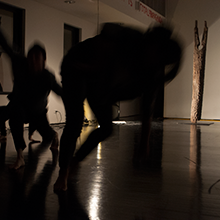 Catherine Galasso is a choreographer and media artist based in Brooklyn and San Francisco. Since 2006, she has created several cross-disciplinary cinematic dance works steeped in historical narratives. Real-life idiosyncratic characters are frequent platforms of inspiration for Catherine’s pieces, such as the man with the Guinness record for being struck by lightning seven times, and French cinema pioneers, the Lumière Brothers. Her works have been performed at Joyce SoHo, Danspace Project, Dixon Place, as well as the San Francisco Museum of Modern Art, Harvard University’s Carpenter Center, the Bibliotheque National de France in Paris, and the International Theater Festival in Kosovo. While in residence at ODC Theater in San Francisco from 2008-2011, Catherine was the first dance artist to be commissioned by the San Francisco Film Society, and the youngest artist to receive a Match Grant from The San Francisco Foundation. She has also held residencies with the Headlands Center for the Arts, the Lower Manhattan Cultural Council, and the Atlantic Center for the Arts in Florida. Catherine is originally from New York and was raised in Italy by her father, Michael Galasso, an award-winning composer for theater, film and dance. Catherine received a degree in painting from an art high school in Venice Italy, and a BA in Film from Cornell University. Fall of the Rebel Angels, an evening-length multimedia performance inspired by the work of Baroque painter, Peter Paul Rubens. The piece will employ dance, multi-channel video projections, and pre-recorded Baroque music mixed with contemporary electronic soundscapes, in order to investigate visceral physicality, sensuality, and the spectacular. Peter Paul Rubens was one of the most important painters of the royal courts in Europe in the early 17th century. His portraits, landscapes and history paintings of mythological, allegorical and religious themes, represent the height of the extravagant Baroque tradition. Catherine and her collaborators will reckon with and channel the emotionality of Rubens’ works into movement, through a contemporary lens of guttural, animalistic physicality. The paintings, with their palpable sense of violence and sensuality, are the fodder for this abstract performance work, one that is far from the original topic in terms of recognition, yet embodies the core ideas.